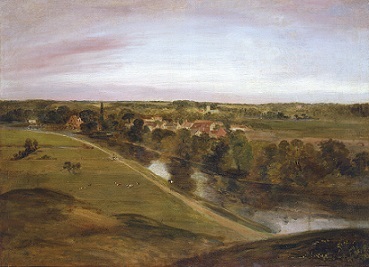 Stratford St Mary from the Coombs, by John Constable RA (1776-1837). Suffolk. Discover your English ancestor in the East Anglia county of Suffolk. The index covers centuries and you may be able to find multiple generations of ancestors for your family tree. Search by either your ancestor’s name or his/her parents’ names. The Suffolk Baptism Index was created by the Suffolk Family History Society. The index includes 351 parishes and 747,204 records across the East Anglian county. For a full list of all the places included in the index view the Suffolk Baptism Index Place List. Suffolk is bordered on the east by the North Sea. It is a low lying area with historic origins. The Angles (after whom East Anglia and England gets its name) settled in the region during the 5th century. The county is a treasure trove of archaeological discovery, including the Mildenhall treasure of Roman silver tableware, which was found in 1942. In the Suffolk Baptism Index we discover the famous Suffolk landscape artist, John Constable. The record shows that John Constable was baptised on 11 June 1776 in St Mary Church in East Bergholt. His parents were Anne and Golding Constable. Constable’s birthplace of East Bergholt, along the River Stour, and the region surrounding the village, features heavily in his work. The area, on the border between Suffolk and Essex, has become known as Constable Country. It includes the scenic villages of Capel St Mary, Dedham, Lanham, Flatford, Stratford St Mary and Lawford. Some of his most famous works include, Dedham Vale (1802), The Hay Wain (1821) and The Cornfield (1826). His work is said to have inspired other contemporary artists such as Gericault and Delacroix. Today his paintings can be purchased as prints, posters, calendars and even on mugs.